Feature Friday: 52 Martha's Road, EDG - Sandpiper Realty, Inc.
Charming home that has a warm friendly invite to you the second you walk through the door. Remodeled to create an old fashioned comfortable feeling with the modern conveniences of the internet age. Traditional-styled Home with an oversized two car garage and finished room above with full bath. Newer renovations, from roof, to windows, to siding, mahogany deck, outdoor shower and top-of-the-line heating system with central air conditioning. The expansive fieldstone patio affords a carefree space for evening dancing under the stars or just relaxing in the afternoon shade. In calculating the interior space, by adding the main two floors of living space, the finished basement, and the finished studio over the garage, the total living area would be about 3,500 sq. ft. The living room has a wood-burning fireplace and opens to a gourmet kitchen with soap stone sink and counters. Custom wood paneling is ready to be stained or painted depending on your preference. 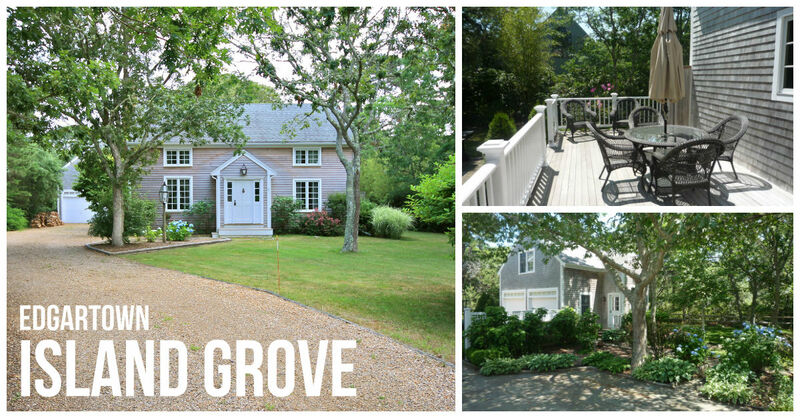 This Island Grove gem is located about equal distance to town and beach and not far from the bike path. Town sewer lines are at the street and may be tied into for an additional upgrade. Currently the main house has three bedrooms and 3 bathrooms, the studio unit above the garage has it's own bathroom.